The Sumatran Rhino is the smallest of all rhino species. They have been around for millions of years, but their time might be coming to an end. Today, there are less than 100 of these critically endangered rhinos left. In Malaysia, we have spent decades desperately working to save this species. Despite countless attempts to find more rhinos in little explored jungles, none have been found of late. In 2015, the Sumatran rhino was declared extinct in the wild. Today, only two captive rhinos are left in Malaysia: Tam, a middle aged male rhino, and Iman, a female who is riddled with tumors. These two are all that stand between the species and their extinction in Malaysia. Tam, which is short for Kertam, is a 650 kg Sumatran rhino. He is the last living male representative of Malaysia’s most endangered animal. The fossil record indicates that this rhino genus (Dicerorhinus) has been around for over 20 million years making it one of the world’s most ancient mammal species. Tam is approaching 30 years old, late middle age for a rhino. He is a mild-mannered animal and enjoys having his belly rubbed and spending hours lazing in his mud wallow. He eats over 50 kg of fresh forest leaves which are gathered from his rainforest home daily and he loves snacking on his favourite fruit – bananas! 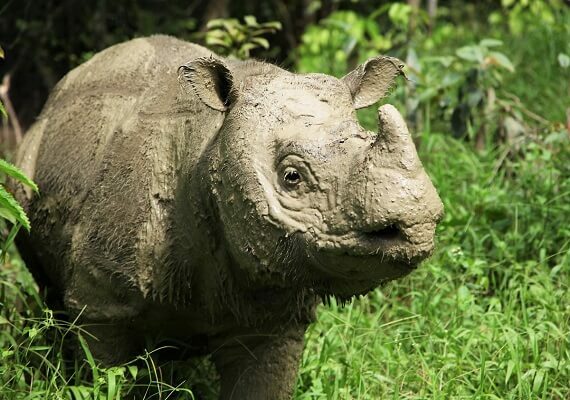 Iman is the last wild Sumatran rhino to have been found in Malaysia. 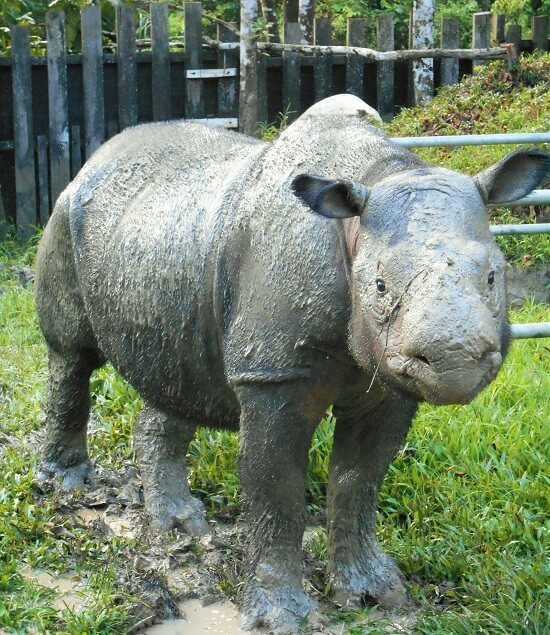 She was captured in Danum Valley and safely transported to the Borneo Rhino Sanctuary in March 2014. This half-tonne female suffers from severe fibroids in her uterus but she retains her oestrus cycle and has so far supplied ten eggs towards the first experimental attempts at in-vitro fertilization in efforts to save her species. Despite her poor health, she is the noisiest and most excitable of the two rhinos in BORA’s care. A third rhino, Puntung, was recently euthanized as she was suffering from an untreatable form of cancer.